Every opinion poll in the Republic of Ireland suggests the European Fiscal Treaty will be passed, but Irish government ministers are still facing a sleepless night. The nightmare scenario for the government is that people wake up on Thursday morning and decide to give ministers a bloody nose by voting 'no' in the referendum. After four years of austerity measures, some anti-treaty campaigners are predicting the "revenge of the people". Although the final opinion polls predicted a clear vote in favour of the treaty - 60% to 40% - there is some evidence of the gap beginning to close. Some 'yes' campaigners say it may now be 55-45 or even 53-47. As one Irish government source put it: "Opinion polls are based on opinions, not actual votes. "No-one will be sleeping easily until the final ballot papers are counted." That is likely to be late on Friday. Countries around Europe will be watching with interest. Whatever happens in Ireland, there are likely to be repercussions in the eurozone, one way or another. A high turnout is not expected, not least because the treaty is so complicated. Some canvassers were so scared of being quizzed by voters about the intricacies of the EU fiscal pact and the ESM ( European Stability Mechanism ) that they put leaflets through the letterboxes of Dublin houses - and then ran before anyone asked them a question. The Irish prime minister, Taoiseach Enda Kenny, did his best to avoid euro-jargon in his nationwide TV address appealing - almost pleading - with people to vote 'yes'. Looking down the barrel of the camera, he said: "You have played your part in the progress Ireland has made in the last year. And I thank you for that. "I ask you to make a further contribution by coming out to vote 'yes' on Thursday. Yes to stability. Yes to investment. Yes to recovery. Yes to a working Ireland." The problem is that the unemployment rate in Ireland is 14% and an estimated 40,000 people a year are emigrating, mainly to Australia and north America. When the 'yes' campaign put up posters saying vote for the treaty "for a working Ireland", a protester wrote underneath it "in Australia". Controversially, Enda Kenny refused all offers of a head-to-head debate with the 'no' camp, led by Sinn Fein president Gerry Adams. Mr Adams also made a direct appeal to voters: "Don't be fooled. Be wise. Join with the millions across Europe who are demanding an end to austerity. Ireland's 3.1m voters have twice rejected European Union treaties in referendums in 2001 (Nice) and 2008 (Lisbon), although both votes were then overturned in repeat polls. This time, the government is promising to accept the will of the people. Since Ireland joined the Euro the country has gone from boom to bust to bail-out. It is halfway through a three-year £67bn funding support programme. Thursday's referendum could turn out to be a watershed moment, in terms of Ireland's attitude to the current policy direction of the eurozone. 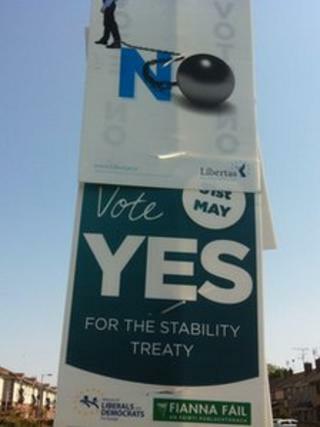 The 'yes' camp say the treaty will bring stability; the 'no' camp say it will result in austerity. Both sides are making a final push for votes, across the Republic of Ireland's 26 counties. In spite of their fundamental differences, they have one thing in common - no sleep until Friday. For the latest on the referendum, follow @BBCMarkSimpson on Twitter .